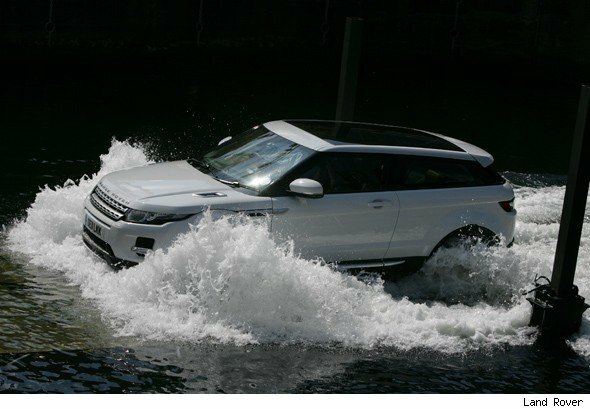 The rumour mill has been going crazy this afternoon with news that a performance Range Rover Evoque is in the pipeline. The story, broken by Autocar, comes from a chat with David Mitchell, Evoque program director. Asked whether the style-tastic Evoque could take more power than the current 237bhp range topper, he commented: "The chassis can take it." How much power? It's rumoured to kick out around 300bhp thanks to a breathed on (well, even more so) version of the 250bhp engine providing the upcoming Ford Focus ST.
Mitchell admitted to having a steer of the racy Evoque as a pre-production mule. Range Rover doesn't currently have a hot sub-brand earmarked for the Evoque, though 'Epoke' might fit - as in, an Evoque with poke. The other 'hot' cars in the Range Rover portfolio go with the 'Supercharged' handle. But if we were forced to guess then you'd do well to pay attention to next year's Geneva Motor Show.